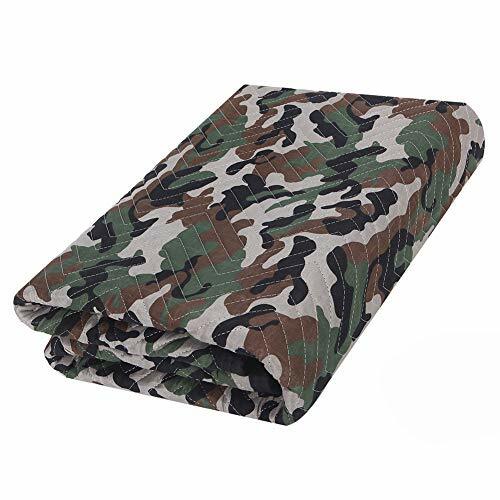 SOMIDE Luxury Camouflage Moving Blankets, Ultra Thick, Double Batting, Colorfast, 72'' x 80'', 5.8 Lbs/pc, Multi-Porpose for Pet Supplies, Sound Barrier, Hunting and Outdoor. SOMIDE is a professional manufacturer of Moving Blankets, always commits to providing the highest quality products at the most competitive price direct to you. Why buy moving blankets ? Whether moving or storing housewares and other valuables, moving blankets can protect your precious items from accumulating dust, dirt, debris, moisture or other damaging residue. Moving blankets are helpful supplies to have while camping, hunting, for picnics, as dog blanket, in the workshop, under vehicles and much more. We use white PP bags and nylon straps to pack, no metal fastener, much safe when unpack. Any comments from clients will be responded with satisfied solutions in 24 hours including holidays. SUPREME GRADE : 72" x 80", 5.8 Lbs/pc, Durable Camouflage on top, Black Non Woven on bottom. Protect furniture, appliances, valuable items from scratches, nicks, dirt, and moisture when moving or transporting. SUPERIOR CUSHIONING : Made by Double Layers padded virgin cotton batting. These blankets are quite thicker and offer superior protection compared with the most competitiors' blankets made from inferior materials. CLEAN AND SOFT PADDING : No dust inside the batting. No "Horrible" Smell. Blankets not bleed when get wet. Avoid the stain on furniture during moving or transporting. DURABLE : 6 Needles/Inch . Double-Lock stitched fabric with polyester binding. Zig-zag stitching holds inner cushioning in place for consistent padding protection and prolonged pad life. MULTI-PURPOSE : Moving ; Storage ; Hunting ; Camping ; Picnics ; Sound barrier, dog blanket and much more . If you have any questions about this product by SOMIDE, contact us by completing and submitting the form below. If you are looking for a specif part number, please include it with your message.